I am thrilled to have some of the new releases from Tim Holtz in my hands and couldn't let a lack of studio time stop me from sharing a card with you... this is a simple one that turned out entirely different than what I started creating, but the basic combination of elements is still there :) When I saw the long scribble in the 'Media Marks 1' set, it reminded me of a flower and I wanted to try using it behind one of the new die cut 'Wildflower Stems 1' designs. Both designs are more than 5" tall, larger than I imagined when I ordered them, but so pretty as a statement piece on a card! I die cut an edge on a 5.5" kraft card and had originally planned to have the flower on the right panel... but in the end decided some simple stamping on kraft was best, especially when I thought to combine it with a piece from a 6x6 paper pad I've had in my stash for 6 or 7 years! 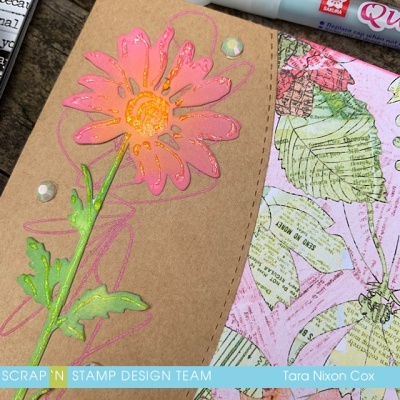 LOL The scribble was stamped in Picked Raspberry Distress Oxide Ink, which is also the color I used on the flower die (together with Spiced Marmalade for the flower center and Mowed Lawn for the stem). 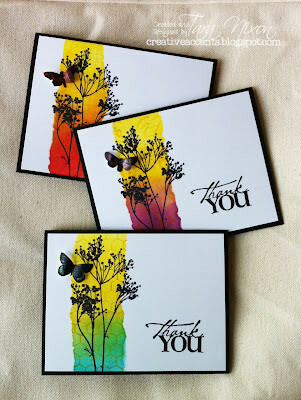 A bit of 'blizzard' Nuvo Glitter Drops were scribbled loosely on the colored flower for a bit of dimension and sparkle. I glued the colored flower onto the kraft base with a Sakura Quickie Glue Pen. Since I was adding a large piece of patterned paper, I kept the rest simple- a small talk sentiment (I think this is from the original set) and a bit of bling complete my card! 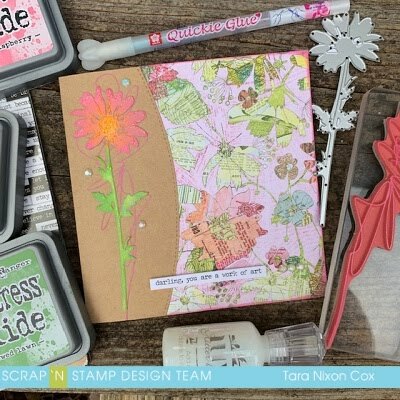 I hope you like it... you'll be seeing more projects featuring both the stamps and die set in the coming weeks, but I enjoyed using them together on this card!